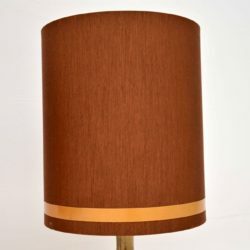 A lovely vintage desk / table lamp made in France, this dates from the 1960’s. 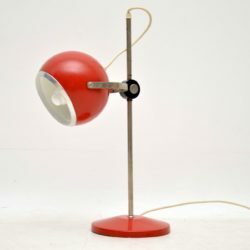 It’s made from steel, painted red on the shade and base. There is some minor surface wear here and there, seen in the images, this has been re-wired and PAT tested for safety, it is in good working order. 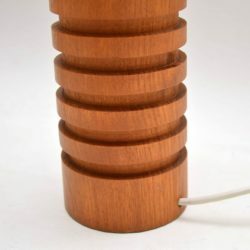 The shade tilts and can be raised and lowered along the shaft. 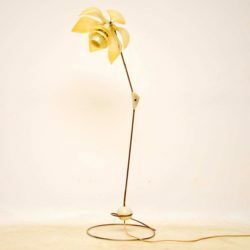 A stylish, unusual and top quality vintage lamp, this dates from the 1960’s. 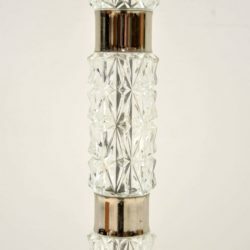 It’s beautifully made from crystal glass and chrome, with the original lamp shade. The condition is excellent for its age, wit’s clean and in good working order, this has been PAT tested for safety. The shade has some minor surface wear here and there, as seen in the images. 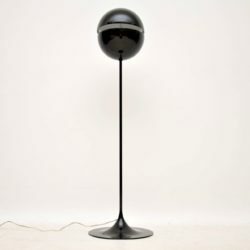 A stylish designer floor lamp, this was designed by Andrea Modica, it was made in Switzerland by Modica. It dates from the late 20th century, and is in good condition, with some minor surface wear here and there; it’s in good working order. 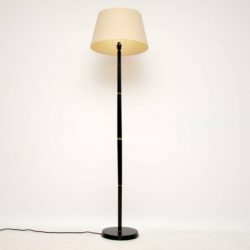 A very stylish and well made vintage floor lamp in ebonised wood with brass trim, this dates from around the 1950-60’s. 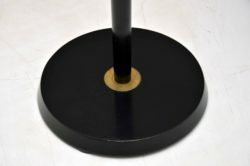 When we obtained it there was quite a bit of surface wear to the ebonised wood, so we have had it re-ebonised and polished, the condition is excellent throughout. We’ve also had it newly re-wired, so it’s in great working order. The shade is in good condition, there is just some minor damage to the inside lining, seen in the images. 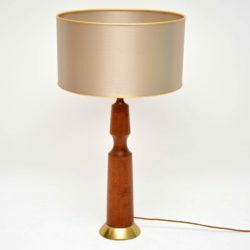 A beautiful pair of vintage brass lamps, recently imported from Italy. 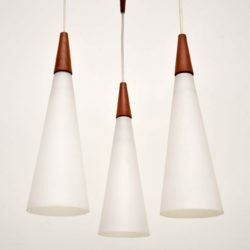 They have a lovely shape and stunning original shades. We’ve had these newly re-wired with gold flex cable, they are in good vintage condition and in good working order. 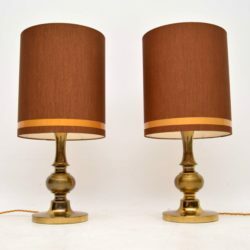 A beautifully made and very stylish pair of vintage teak lamps, these date from the 1960’s. They are in lovely condition with hardly any wear to be seen, we have had these re-wired and they’re in good working order. 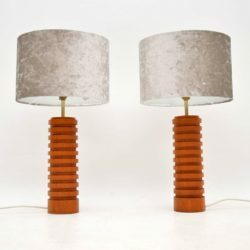 We have paired these with some lovely new crushed velvet shades. 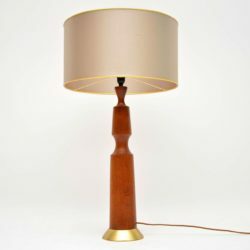 A beautifully made and quite large vintage Danish table lamp in solid teak, with brass trim. 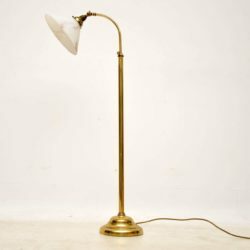 This is in superb condition for its age, its been cleaned and re-wired, it is in good working order and has been PAT tested for safety. 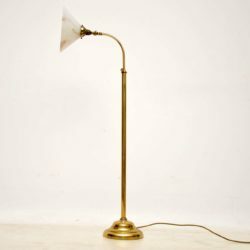 A beautiful vintage brass lamp with a white glass shade, this dates from the 1960-70’s. 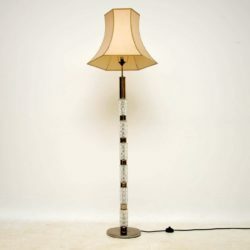 It has a telescopic mechanism, the height can be adjusted to suit your needs. 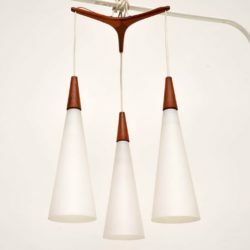 The glass shade can also be adjusted and tilted to various angles. This has been re-wired and is in good working order. 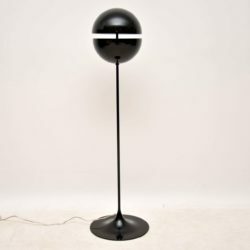 An absolutely stunning and extremely rare floor lamp, this is the Symanka SY1, designed by Gunter Ssymmank in 1959. This was made in Germany by Integra, it dates from the 1950’s, it is in excellent original condition and good working order. 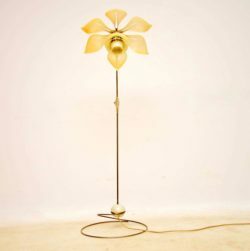 This has a fabulous design, the petal shades are adjustable and it sits on a coiled base. The makers mark and model is seen under the base. 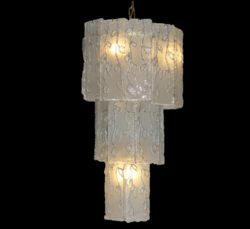 An absolutely stunning and extremely well made vintage chandelier, this dates from the 1960’s. 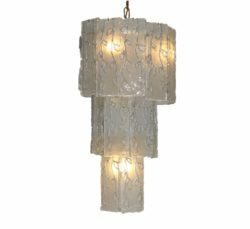 It has a brass frame and many frosted glass panels that hang from the frame in three tiers. The condition is superb for its age, this is wired and in good working order. 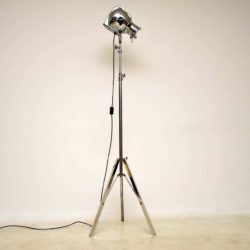 A stunning and iconic British design, the Strand theatre spotlight was made by the Strand Lighting company in London. 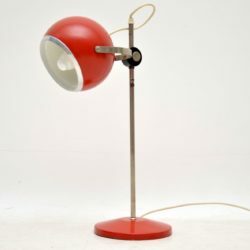 Originally designed in the 1950’s, this is quite an early version, dating from around the 1950-60’s. 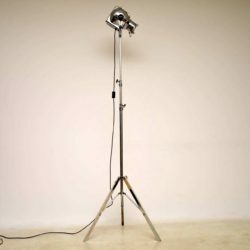 It has been polished, cleaned and mounted on an adjustable steel tripod base. This has also been re-wired and is in good working order.